I know it might be a little odd, but I place a tremendous amount of importance on how I, as a parent, deal with holidays. If I have somehow failed to measure up to the idea in my head of how nice I’d like say, Easter to be, I will suffer some pretty severe self-recriminations. This year, I’ve been equally worried about what the Easter Bunny may have in store for us, and how it will measure up. After all, what is an Easter basket without CANDY? I keep thinking to myself, wait! Didn’t we just do this? At Valentine’s Day? At Christmas? I was shocked by the not-inconsiderable amount of treats which came home accompanying both my daughters’ brown bags of Valentines this year- and of course we’re not talking Grandma’s brownies here, we’re talking crappy pink lollipops in the shape of Tinkerbell; essentially a chemical oddity on a stick. Since when, I thought, did every Valentine have to come with an ad for the sugar industry- and Disney- attached? Probably it was only a matter of time. I’m fairly certain St.Patrick’s Day Pixie Sticks and Groundhog’s Day gummies will be next. 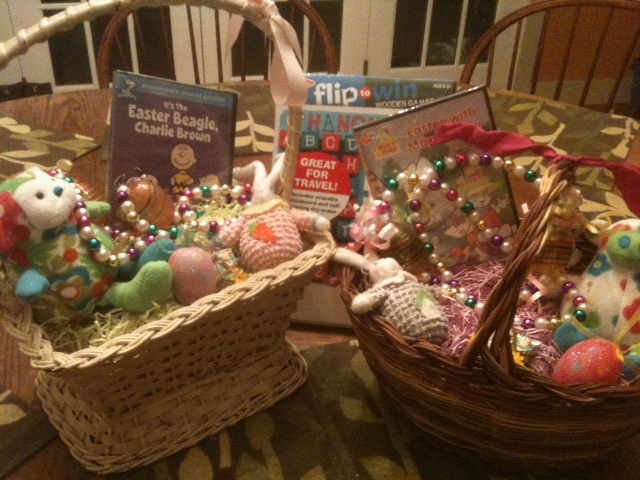 But after assembling their baskets this evening and putting them out I am cautiously optimistic. No, there are no jellybeans, chocolate bunnies, or Reese’s Peanut Butter Eggs (my personal favorite). Not a Peep. In fact, there’s not an edible thing in them, although I briefly toyed with the thought of putting some carrots with the green tops hanging down in, just for fun, but thought better of it. Instead, I have Easter-themed videos, some small, amorphous, but very Springy-looking stuffed animals, sparkly egg ornaments, some pretty Easter Mardi Gras necklaces (thank you Easter Grandma), and a hangman game for them to share. I put all the things out and stood back, almost afraid to look- would it be, somehow, lacking? Would the sugar-less-ness of it all just be too, too obvious, and slightly sad? But I didn’t think that. The baskets looked perfectly festive and Easter-like, I realized . Thank God. So I’ve at least passed my own test this No Sugar Easter… I wonder what the kids’ verdict will be. Since Easter is about spring, fertility, and the reawakening of the earth, it made most sense to give flower seeds of a blue flowering vine plant my grandmother grew in her yard. Children can first grow indoors and transplanted when the ground is warm. A great substitute for sugar that only last momentarily and not in the healthiest of ways. We don’t do candy for Easter baskets. We did paints, playdoh, books and CDs. She got one sucker and a ‘kinderegg’ which is a chocolate egg from Europe with a prize inside. The sucker is still somewhere in the basket. But my toddler is still a total sugar-holic. I spend everyday trying to orient her toward healthy options and hearing ‘Can i have some candy’ in response. Ad nauseum. Sigh. You are currently reading A Year Of No Sugar: Post 42 at Eve O. Schaub.